Treatment is achieved by sending a low electrical current to the area of the brain in question via the electrodes for about 20 minutes, repeated over a number of sessions. Apart from a 15-second itching sensation, Maiques says that patients do not feel anything during the process. By exciting the neurons with the current, it has a positive effect on the rehabilitation of people with strokes in combination with physical therapy. 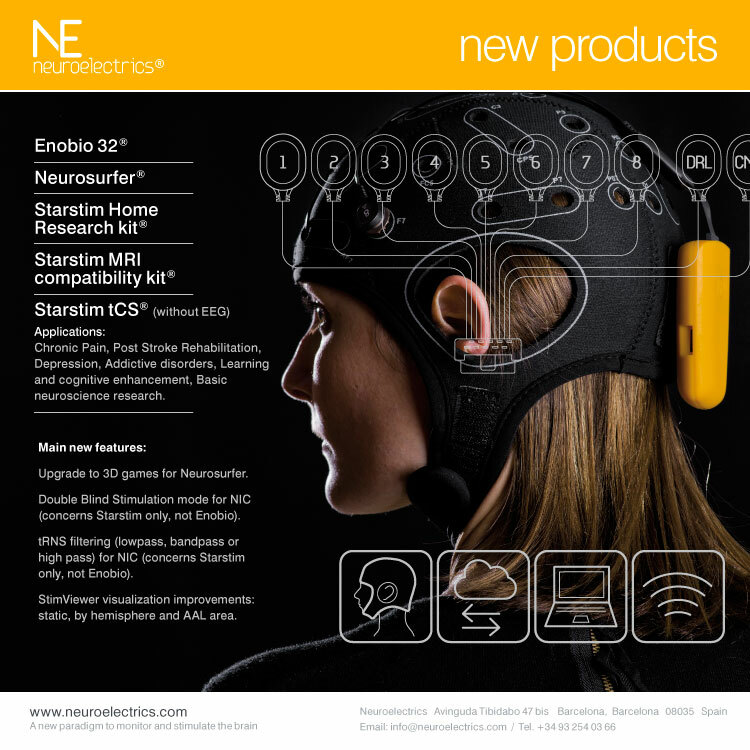 Neuroelectrics, makers of the high-end tDCS devices, Enobio and Starstim keep a wiki. Reddit user redidtsmith reminded me they have montage info on their wiki. 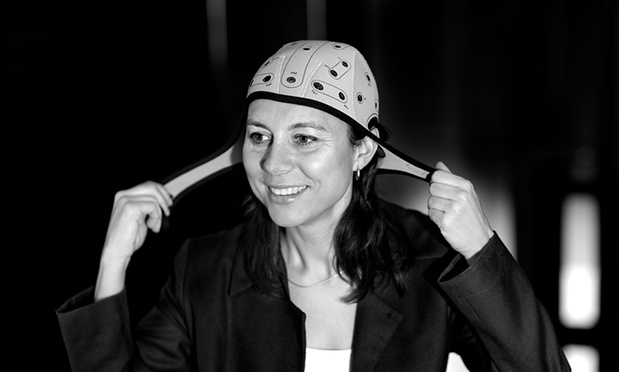 We met Neurolectrics in my first podcast interview with Ana Maiques. They created Enobio, a wireless multi-channel EEG cap, and Starstim, which adds tDCS (tRNS, tACS) alongside of EEG monitoring. They also make a powerful suite of software for controlling and monitoring their devices. They’ve recently added a few new products and some updates. They also have a blog! Enobio 32: EEG Cap now in 32 channels. Neurosurfer: Combine 2D & 3D (inculding Oculus Rift support) Neurofeedback games. Starstim Home Research Kit: Allows physicians to facilitate telemedicine tDCS sessions. Starstim tCS: Starstim without EEG. Let us start with the application of DC current and its study at neuronal level. While the electrical current goes through the scalp and cortex it encounters different mediums. Each time it goes through the limit between two mediums it leaves some charge behind. This is what happens when traversing the neuronal membrane, which constitutes the interface between the interior of the neuron and its environment. These charges generate a voltage difference, which makes the resting potential of the membrane either decrease or increase, depending on its sign, i.e. on the current sense. Therefore the neuron is correspondingly either more likely or less likely to fire. When applying an anodal current, the action potential thresholds of pyramidal cells under the anode application area are lowered, meaning that they fire more easily. Therefore this current, and its associated electrical field, is considered excitatory. On the other hand a cathodal current would present an inhibitory effect. via Quick and Dirty Guide on Transcranial Current Stimulation. The developers of Starstim, Neurolectrics, have a blog where they frequently discuss tDCS (and EEG). Here’s a snippet from their latest on tDCS & pain. Hit the link below to their full article. Is transcranial current stimulation tCS, including direct current, tDCS, alternating current, tACS, or random noise stimulation tRNS effective? Now that is a good and difficult question! Let me try to review recent developments. In a recent post I provided an overview of tCS in Stroke. Here I do the same but for Pain. Please let me know if you think I am missing some important one! I have relied on Google Scholar and also PubMed to carry out the search, including the terms of tDCS, tACS, tRNS as well as Pain since 2012 and till Sep 2013.
via tDCS clinical research – recent highlights: Pain. Well here we go! Episode one of the DIY tDCS podcast. 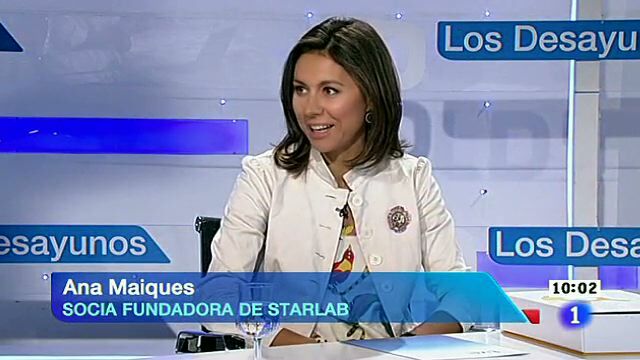 Ana Maiques is co-founder (with Giulio Ruffini) of Spanish-based Starlab. Their spin-off company, Neuroelectrics makes Enobio, a research-quality wireless EEG device, and Starstim, a multi-channel wireless tcs & tDCS device. Download the interview here (zipped mp3). Show notes after the fold. (If you speak Spanish you might enjoy the interview these photos were taken from.) Also, if you’re an EEG or tDCS researcher or clinician (or VC) on the East Coast, Ana is frequently in the New York and Boston area and is happy to discuss Enobio and Starstim. Neuroelectrics will be at the Advances in Mediation Research conference in NY Jan. 17 2013. (Schedule) Check out the Neuroelectrics blog for excellent tDCS and EEG info. 8 in U.S. and 7 in Europe. Different pathologies. Results to be published soon. Couple of groups showing very measurable results. 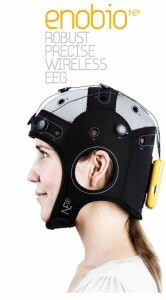 The Muse, Neurosky, Emotiv Home EEG devices? Limitation is number of channels. Started Enobio with 4 channels, but feedback from medical community lead to developing a 20 channel Enobio. But we’re looking at the medical application of EEG. Doctors and researchers require the maximum coverage of the head. Signal quality is very important. medications >> less pain, better toleration of treatment. Software runs on a Mac. This comes to us via the Neuroelectrics.com blog. I’m very excited to see Neuroelectrics on the scene. I first noticed their device Starstim (pictured), popping up in news around Roi Cohen Kadish’s ongoing tDCS trials at his Oxford lab (see). I believe Neuroelectrics is a Spanish company. What’s especially exciting to me is that they also make an EEG device called Enobio and are working on the ability to map brain activity with EEG while undergoing tDCS. Think about that! Live, in-the-moment feedback on exactly what effect your tDCS is having. More than 100 studies have been performed using tDCS in healthy controls and in patient populations, and no serious side effects have occurred for a review, see Nitsche and others 2008. Slight itching under the electrode, headache, fatigue, and nausea have been described in a minority of cases in a series of more than 550 subjects Poreisz and others 2007. Detailed studies have been performed to assess the safety of tDCS. These have shown that there was no evidence of neuronal damage as assessed by serum neuron-specific enolase after application of a 1 mA anodal current for 13 minutes Nitsche and Paulus 2001; Nitsche, Nitsche, and others 2003 or MRI measures of edema using contrast-enhanced and diffusion-weighted MRI measures after application of a 1 mA current for 13 minutes anodal or 9 minutes cathodal; Nitsche, Niehaus, and others 2004 […] In addition, a recent study was performed in rats using an epicranial electrode montage designed to be similar to that used in tDCS Liebetanz and others 2009. This demonstrated that brain lesions occurred only at current densities greater than 1429 mA/cm2 applied for durations longer than 10 minutes. In standard tDCS protocols in humans, a current density of approximately 0.05 mA/cm2 is produced. 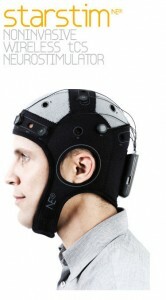 More about the Neuroelectrics Enobio EEG device.